Nestled in a beautiful old home, the Dorset House Backpackers is a hostel suitable for people of all ages, from all corners of the earth. The rooms are cozy and offer comfortable beds and plenty of room to move around. They are all positioned near a well-equipped kitchen that leads to an outside eating area, perfect for breakfast in the sun. Downstairs you will find a recreational room that offers a TV, internet facilities, comfortable couches, a pool table and enough brochures to tell you all, and everything there is to know about Christchurch. The bathrooms were clean and modern, with hairdryers available in many of them. Positioned just a 10-15 walk from the city centre, this hostel is perfect if you are after a quiet place to stay, just outside of town, with quaint and clean facilities. 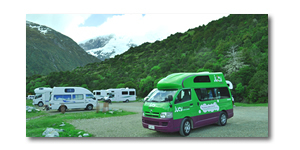 Nestled beneath the towering (and usually cloud covered) Mt Cook, the White Horse Hill Campsite is the only campground in this National Park and is perfect for campervan travelers and those wishing to brave the cold in a tent. Surrounded by beautiful snow covered mountains and with several walks nearby, this campground has toilets (which are cleaned on a daily basis and water from taps (which you can drink). There are quite a few sites, but it pays to get in early to get the best views. Located on the beautiful Otago Peninsula, in Portobello, the Portobello Village Tourist Park is one of the only places to camp on the peninsula and is a fantastic and friendly little place to spend a few nights. Surrounded by lush green hills, the facilities here were clean and handy and included a huge camp kitchen, clean bathrooms (with hairdryers), an Internet room and a laundry and clothesline. The sites were lovely and grassy, but there aren’t too many of them so it will pay to ring in advance and reserve one. 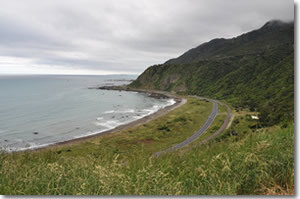 Milford Road in the beautiful Fiordland National Park offers several great Department of Conservation campsites, but the pick of the litter of the standards sites would have to be at Mackay Creek. Camp right on the bank of a gorgeous flowing stream, surrounded by wildflowers and glorious snow-capped mountains to enjoy dinner with a view and a wake-up call of babbling brooks and the call of the native birds. The facilities are extremely limited, with only one toilet on site, but the view makes up for roughing it. Beware of the sand flies and be sure to take plenty of repellant. Boasting a very "Lord of the Rings" atmosphere, the campgrounds at Mavora Lakes are well spread out, with plenty of areas to choose from. Camp by the lake or avoid the mozzies and set up camp nearer the mountains. There are several pit toilets positioned on each campground, and fresh water is available from the lake. There are two swing bridges nearby, and plenty of opportunities for trout fishing. Manapouri is a charming little town that boasts one of New Zealand’s most spectacular lakes. The Manapouri Holiday Park is a great place to stay to experience the very best of the lake environment, offering friendly service and a prime location just a 2 minute walk from the lake’s shore. This shady park offers tidy bathrooms, a large kitchen and dining area, and a small general store, where you can quickly stock up on needed supplies. Many of the sites don’t offer lake views, but the quick walk easily makes up for this. 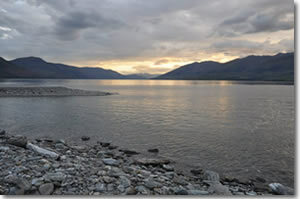 Easily one of the most beautiful campgrounds on the South Island, the Boundary Creek Campsite is nestled on the northern shores of Lake Wanaka, right on the edge of the beautiful Mt Aspiring National Park. Wake up with a lakefront view and enjoy breakfast by the water as you soak up the majestic mountain scenery and appreciate the shade of the nearby beech trees. There are two easily accessible toilets, a water tap and sink and taps to fill up your water tank. A picnic table and shelter is also perfect for enjoying outdoor meals. Beware: There are hoards of sandflies here so be sure to bring plenty of repellant. Enjoy a little luxury when you stay at the Rainforest Retreat Holiday Park in the alpine village of Franz Josef. Relax after a day of glacier hiking in the spa and sauna (available to all guests), or down an ice cold beer at the bar, that puts on happy hour from 7-9pm. The park is surrounded by lush rainforest and boasts huge bathrooms (with hairdryers), a nifty camp kitchen with plenty of cooking and preparation space, and is just a 5-10 minute walk to all of Franz Josef's adventure activities. Not my favourite campsite, but perfect for an overnight stay, the campground on Lake Mahinapua is large and open, with almost all sites featuring water views. The toilets and wash sinks are in a handy location and there are several taps scattered throughout the grounds for added convenience. The drive to the campground from the highway is deeply forested and unsealed, and is quite pretty. The lake also boasts a nice jetty; a great subject for avid photographers. Location: Just off SH6, 10 KM south of Hokitika. This fabulous holiday park is positioned in the beautiful coastal town of Kaiteriteri, with many of the sites overlooking the town's stunning bay. The park itself is huge and offer a whopping 400 sites and 17 cabins. There are also 5 large amenities blocks spread throughout the grounds, with each including bathrooms, laundries and kitchen. There is a friendly family of ducks that wander the park at all hours of the day, so be prepared for some company while enjoying your meals. The park is ideally located just a short walk from activities like sea kayaking, water taxis and bay cruises, with some of Abel Tasman’s best swimming spots just minutes away. This fabulous holiday park is situated just a short walk from the beach, making it the number one choice for camping in Nelson. The park is well spread out, with central amenities including a well-equipped kitchen, adjoining a TV room and Internet facilities, and a huge bathroom and laundry. The staff here are incredibly friendly and give you the option of setting up camp wherever you so desire (within the park's boundaries that is). Positioned just behind Okiwi Bay, this relatively small DOC site is perfect for overnight stays and the best part is that it is free! Set up camp on the grassy open flat before exploring the bay or taking one of the several walks through the surrounding mountain scenery. There is only one toilet at this campsite and no available water, so make sure your water tank is full before staying here. The town of Hanmer Springs is masked under a sleepy disguise, but upon arrival you will find there is an endless array of adventure attractions on offer. The best place to rest up after a day of fun (and relaxation in the thermal pools) is at the Hanmer Springs Top 10 Holiday Park. Offering a huge selection of grassy sites, clean facilities and friendly service, this park is a fantastic base for your stay here. The prices are also extremely reasonable, which will make your stay here that touch more enjoyable. DOC sites are the perfect option for travelers on a shoe-string budget and who don't mind staying in areas with limited facilities. Many of the standard sites offer toilets (most likely pit), water and picnic tables, with BBQ's and cold showers provided at a selected few. They are positioned in some of New Zealand's most beautiful and untouched National Parks and Recreational Reserves and are perfect for travelers wishing to escape the crowds and stay in touch with nature. A great money saving idea is to stay in DOC sites every second night, and spend the other nights in holiday parks. 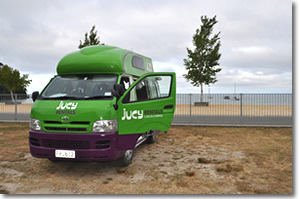 Many of New Zealand's holiday parks offer great facilities and are perfect for charging up your campervan’s batteries and enjoying the luxury of a bathroom, kitchen and laundry. For an extensive list of the DOC sites on New Zealand's South Island, pick up a brochure at any of the Information Offices scattered throughout the island, or check out the online version.